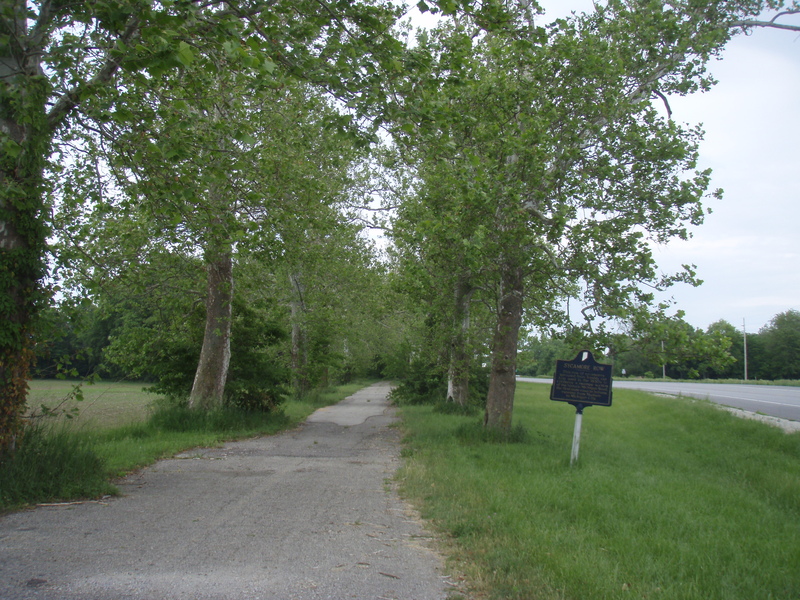 In north-eastern Carroll County Indiana, along State Road 29, there is a double-row of sycamores that have the appearance of an early street tree planting. These trees are aptly named “Sycamore Row” and at one time numbered thirty six on the west side and fifty plus on the east. The trees create an allee along an abandoned section of the old Michigan Road. There are many stories that surround these trees with one noting that early residents remembered the trees as saplings in 1868. The best explanation for this beautiful allee of sycamores is that they sprouted from the fresh cut ends of logs that had been laid to form a “corduroy road”. The creation of a corduroy road was a practice used in early road construction to create a crossing through a wet or swampy area. The concept of this practice is that trees would be cut and the trunks would be laid side-by-side with the ends nailed to each other to keep them from moving. Sometimes mud or gravel would be laid on top to even out the road and to lessen the jolting that would be felt as a wagon bumped from log to log. Some of these trees may be the original saplings remembered by the early county residents in 1868 and some may be sprouts from trees that died or were cut over the years. Either way, these trees stand as a testament to our earlier ancestors and their tireless struggles to expand Indiana. Notes: a) Dr. William Hoover, Professor of Forestry at Purdue University has indicated that this type of re-growth (from a live buried log) is possible and is called Vegetative Regeneration. b) A State Highway Commission’s historical marker says they sprouted from trees laid down in the 1830s, but it is more likely that they were from the 1850s when the road was upgraded. Trees in History” series provided by Jud Scott, who is a lover of trees and history. If you need help preserving a tree or resolving a tree conflict, Jud can be reached at 317-815-8733 or by email at Treeconsultant@aol.com. Sycamore trees along Sycamore Row! ~ by daniel on December 24, 2010. Do those have the caliper to be 160 years old? Want to air knife a couple and see if the original road bed fibers (organics)are still there? Very nice article, do more!